Why? Because, if you’ve come straight to this post, Cuisinart are giving away two weekend tickets to Food Blogger Connect in August. FBC was started pretty informally in 2009 and is growing each year. Well established bloggers, food writers and broadcasters are invited to speak about and their experience and know-how to newer food bloggers. This year there’s a photography workshop with Béatrice Peltre of La Tartine Gourmande, and a video cookery demonstration with Anjum Anand, who’s become a successful Indian TV chef. And who’s providing her equipment? Cuisinart! Who are also being incredibly generous in giving two people the chance to go, even if they’re going already. And an opportunity to take part in the video demonstration. To qualify for the draw you have to come up with a smoothie, make one of Cuisinart‘s or one from Anjum Anand‘s books. Hence my marathon. And then post it on your blog, plus tweet it and put it up on the FBC Facebook page, and go to the post that announced it and leave a comment. Smoothies are somewhat addictive, and when you start looking there are so many combinations. I wanted to do one around vanilla, and then thought, why not blackcurrants. I can nibble away on summerfruits right off the stalk. They remind me of summer on the farm I lived on up to the age of 10 when moved to a Big House. My mother lived quite The Good Life, raising chickens and ducks, and had a goat called Daisy that only she could milk. Anyone else who tried would find out that Daisy was a pretty good boxer! Mum also had a vegetable patch where peas and beans climbed up sticks, and we would sit among the leaves and eat the sweet juicy peas, right out of the pod. In another corner of the patch she grew raspberries and red- and blackcurrants (groseilles and cassis). One of the things me and my sister loved as kids was a blackcurrant ice cream mum made. A dense flavour that coated your mouth with lusciousness. So imagine our surprise when we asked her for the recipe as adults and she admitted it was some packet mix! So how surprised and pleased was I that this smoothie turned out to be the closest in taste to that pud I think I’ve come across since then. I also tossed in some blueberries (myrtilles), and even some blackberries (mûres) I’d found at the market. I wasn’t sure about the seasonality of them, but they are from France and they brought back another childhood memory from the same era of us stuffing ourselves with blackberries picked down on the old railway track of our little South Somerset village. Now not so little. Blitz the berries in a blender. Add the yoghurt and blitz a bit more. 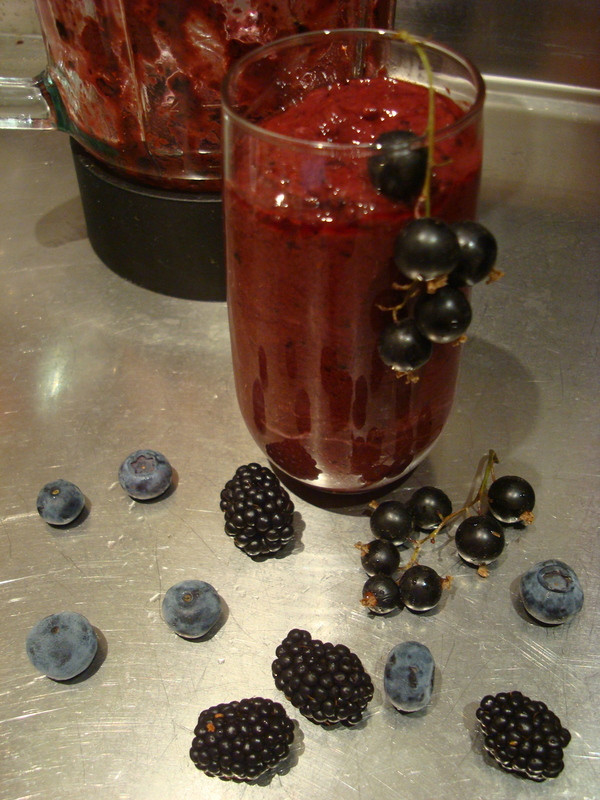 This entry was posted in Smoothies and tagged Anjum Anand, blackberry, blackcurrant, blueberry, Cuisinart, FBC, redcurrant, smoothie. Bookmark the permalink.